Slice 4-5 kiwi fruits into 1-inch pieces and place on cookie sheet. Insert a wooden treat stick into each kiwi slice. In a microwave safe bowl, microwave the dark cocoa melts for 45 seconds and stir. Continue to microwave in 15 second intervals until completely melted. Stir after each interval. Dip each kiwi pop into the melted chocolate (or you can spoon it on). Because they are frozen, the chocolate will harden almost immediately. 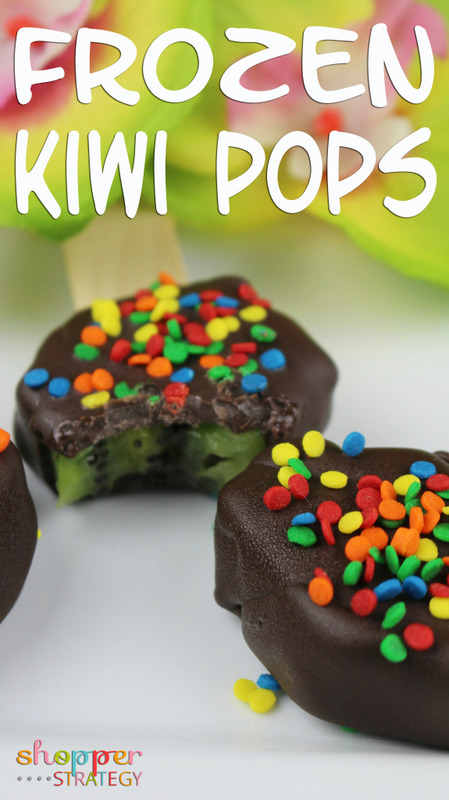 To add sprinkles to each pop, you must sprinkle the kiwi pops as soon as you add chocolate to each one. Cover with plastic and place in the freezer until ready to serve.